With energies exceeding 100 billion electron-volts (100 GeV), the surprising gamma-ray pulses were detected by the VERITAS telescope array at the Whipple Observatory in Arizona and reported by an international team of scientists in a paper in the October 7 issue of Science. Corresponding author Nepomuk Otte, a postdoctoral researcher at the University of California, Santa Cruz, said that some researchers had told him he was crazy to even look for pulsar emission in this energy realm. "It turns out that being persistent and stubborn helps," Otte said. "These results put new constraints on the mechanism for how the gamma-ray emission is generated." "To me it's a real triumph of the experimental approach, not going along with the flow and making assumptions, but just observing to see what there is. And lo and behold, we see something different than what everybody expected," Ong said. 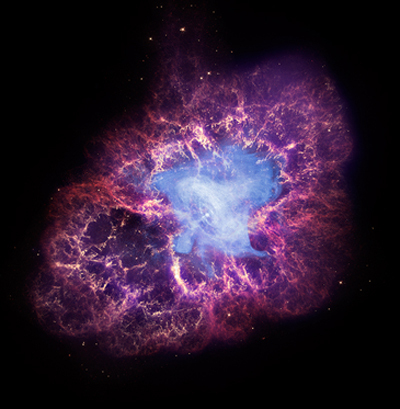 The Crab pulsar is a rapidly spinning neutron star, the collapsed core of a massive star that exploded in a spectacular supernova in the year 1054, leaving behind the brilliant Crab Nebula, with the pulsar at its heart. It is one of the most intensively studied objects in the sky. Rotating about 30 times a second, the pulsar has an intense, co-rotating magnetic field from which it emits beams of radiation. The beams sweep around like a lighthouse beacon because they are not aligned with the star's rotation axis. So although the beams are steady, they are detected on Earth as rapid pulses of radiation. Scientists have long agreed on a general picture of what causes pulsar emission. Electromagnetic forces created by the star's rapidly rotating magnetic field accelerate charged particles to near the speed of light, producing radiation over a broad spectrum. But the details remain a mystery. "After many years of observations and results from the Crab, we thought we had an understanding of how it worked, and the models predicted an exponential decay of the emission spectrum above around 10 GeV. So it came as a real surprise when we found pulsed gamma-ray emission at energies above 100 GeV," said coauthor David Williams, adjunct professor of physics at UC Santa Cruz and a member of the VERITAS collaboration. Prior to these new results, a phenomenon known as curvature radiation was the leading explanation for the Crab's pulsed gamma-ray emission. Curvature radiation is produced when a high-energy charged particle moves along a curved magnetic field. But according to Otte, this mechanism cannot account for gamma rays with energies above 100 GeV. "The conventional wisdom was that the dominant mechanism is curvature radiation. But the VERITAS results have shown that there must be a different mechanism at work," Otte said. "Curvature radiation can explain the lower-energy emission, but we really don't know what causes the very high-energy emission." One possible scenario may be a process known as inverse Compton scattering, which involves energy transfer from charged particles to photons. "That seems to be a more likely scenario now, but we still don't know the details of how this works," Otte said. It is also not clear whether one mechanism dominates at all gamma-ray energies, or if curvature radiation dominates at lower energies and something like inverse Compton scattering dominates at higher energies. According to Ong, researchers will need to characterize the very high-energy gamma-ray emission in much greater detail in order to gain more insight into the mechanisms behind it. "We need to take more measurements and get the exact shape of the spectrum at these very high energies," he said. The VERITAS observations open up a new avenue for testing Einstein's theory of special relativity, which says that the speed of light is a universal constant. One of the predictions of a quantum theory of gravity, which emerges from efforts to reconcile quantum mechanics and general relativity, is that the speed of light actually may have a small dependence on the energy of the photon. This would be a violation of "Lorentz invariance," which is at the core of special relativity, but it might be detectable in the VERITAS data, Otte said. Photons with a range of energies are emitted by the pulsar at the same time. If photons with different energies travel at different speeds, the effect would manifest itself as a slight shift in the position of the pulses at different energies. VERITAS (Very Energetic Radiation Imaging Telescope Array System) is a ground-based observatory for gamma-ray astronomy located at the Fred Lawrence Whipple Observatory in southern Arizona. It is an array of four 12-meter optical reflectors, used to record Cherenkov radiation created by high-energy gamma-ray showers in the atmosphere. These imaging Cherenkov telescopes have maximum sensitivity in the energy range from 100 GeV to 10 TeV (10,000 GeV or 10 trillion electron volts). The 95 coauthors of the Science paper on the Crab pulsar include scientists from 26 institutions involved in the VERITAS collaboration. The five coauthors at UC Santa Cruz, including Otte and Williams, are affiliated with the Santa Cruz Institute for Particle Physics (SCIPP). This research is supported by the U.S. Department of Energy Office of Science, U.S. National Science Foundation, the Smithsonian Institution, NSERC (Canada), STFC (U.K.) and Science Foundation Ireland.